To become an Author requires a mind set. 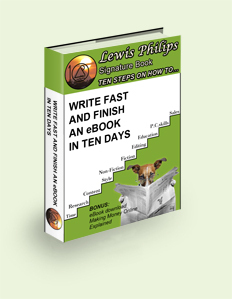 Simply follow the rules, and you can write an eBook in ten days. Impossible you think, but I've been there done it. Revealed in this eBook are my secrets for success. Time management will set the framework for completing your book on time. Research will outline techniques on how to expand your story. Practical writing exercisers and advice will help budding authors become better writers. Content contrary to expectation; never think big when writing eBooks. Exercise your brain with practical writing exercises. Is imitation good or bad? Find the answer in this chapter. Learn about tone and voice to reach your audience. Style: Your style is your voice. Learn how to develop your own writer's signature. Gain insight from contemporary writers. Brush up, and get back to Basic English language skills. Practice practical writing exercises to develop and expand your writing ability. Non Fiction: Know why passion will drive your thoughts to produce the book your have inside you, that's aching to get out. Find more time, stretching and limbering up the mind through mind exercises. Fiction: Learn about genres of fiction. Or could it be a mixture of all the above. Editing: If you had a key to success, then editing will unlock and open hidden talent. Find out the secret to editing success used by Authors and play writers. Practice: Learn how, where and why writing and reading go hand in hand. Find out where to get the best advice from reputable websites. 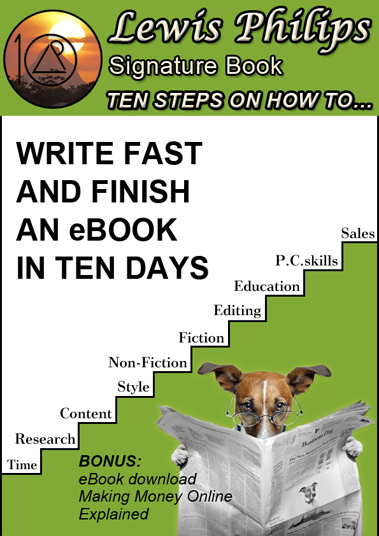 P. C. Skills: brush up on your computer skills with practical advice and web sites to visit to gain a greater understanding of how to utilise these resources to write an eBook in ten days. Pitching it; find good ideas on how to market your book and profit from your writing. Book Binding Made Easy; learn how to bind your own book at home through an easy to understand guide. Free download of my latest marketing book - revised edition - Making Money Online, Explained. Click here and become the Author you want to be. What do you have to lose, with a 100% guarantee? "Like it or get your money back"
Copyright © www.tenstepson.com. All Rights Reserved.